CRAZY DISCOUNT! Was: $469.95 Now: $249.88! Housework is a lot easier with this amazing Robot Vacuum Cleaner! 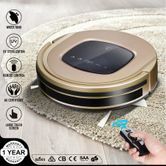 Featuring a host of smart functions this robot cleaner offers wet and drying cleaning, anti-collision/anti-fall sensors and scheduling, to help you remove one more thing from your daily or weekly ‘to-do-list’. The updated main brush design ensures it will not get entangled by wire or hair. More than simply cleaning debris this vacuum cleaner comes equipped with a UV lamp to sterilize floors while the HEPA filter effectively reduces secondary air pollution. The virtually silent operation and remote control makes this bagless vacuum cleaner and must have for any busy household! **Please note: Place charging station against the wall and remove obstacles about 1 meter at two sides and about 2 meters front of the station before charging. Very fast delivery good on timber floor not as good on carpet.